This little piece of trivia from the title character in the 2010 movie Scott Pilgrim vs. the World (which is awesomez by the way) is actually true. The original Japanese version of Pac-Man from 1980 was called Puck-Man, but it was changed to Pac-Man by the time it was released in the west. The objective of the game is to eat all the dots in a maze and not get caught by the ghosts. If Pac-Man eats one of the four larger "power-pellets", he can also eat the ghosts for a short time. The game was designed by Tōru Iwatani at Namco. He felt that video-gaming at the time, with its predominantly Space Invaders inspired themes was male dominated, and wanted to create a concept that could have wider appeal, hopefully bringing females into the arcades. The concept he settled on was eating. The ghosts were also specifically designed to look cute as opposed to scary, and were colored in pastels. It worked brilliantly, and Pac-Man ended up being the first video-game that had a significant female player base. 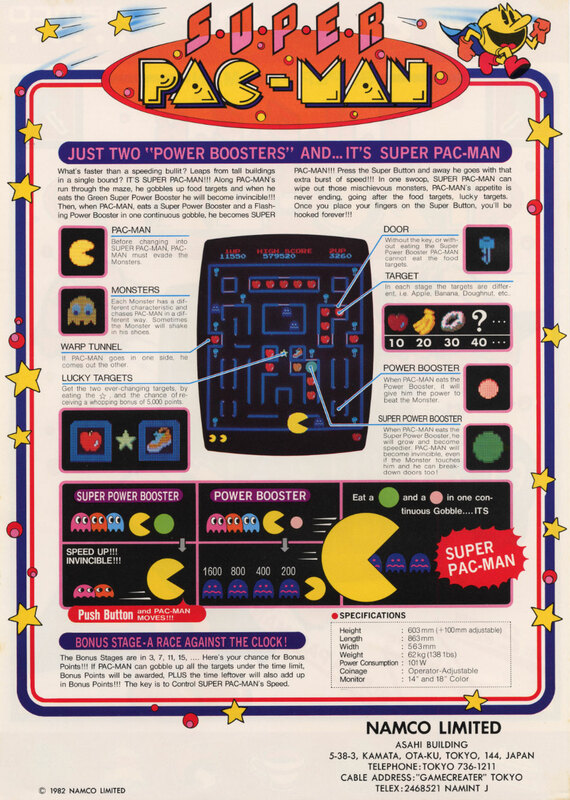 Namco licensed Pac-Man to American distributor Midway for production and distribution in the US, and it became a huge success for both companies. Around this time, a bunch of students from MIT had formed The General Computer Corporation that specialized in making mod-kits for existing arcade games. They used their electrical engineering knowledge to enhance games by inserting code from an external board of their own design into an existing game, thus changing and making it more exciting for people that were tired of it. As the kits needed the original games to run, instead of being modified bootleg copies, they felt they were on solid ground legally. Atari (the BIG game manufacturer at the time) did NOT think so, and subsequently sued them. The case was eventually settled out of court, as Atari suspected they probably wouldn't win. The young upstarts were offered $50,000 per month for two years "to develop video-games", on the condition that they stopped making mod-kits without the consent of the original creator or publisher. At the time the settlement came through they were nearing completion on an enhanced version of Pac-Man. Not wanting to waste the work they allready had done, they contacted Midway to get permission to release the mod-kit. Midway was at this point idle, as they were waiting for Namco to finish their official follow-up to Pac-Man. Midway, upon seeing the mod-kit saw potential sales, and offered General Computer the chance to do a Pac-Man sequel. The mod-kit version improved upon the Pac-Man formula by having four mazes instead of the original one, more bonus items and a Pac-Man on legs called "Crazy Otto". 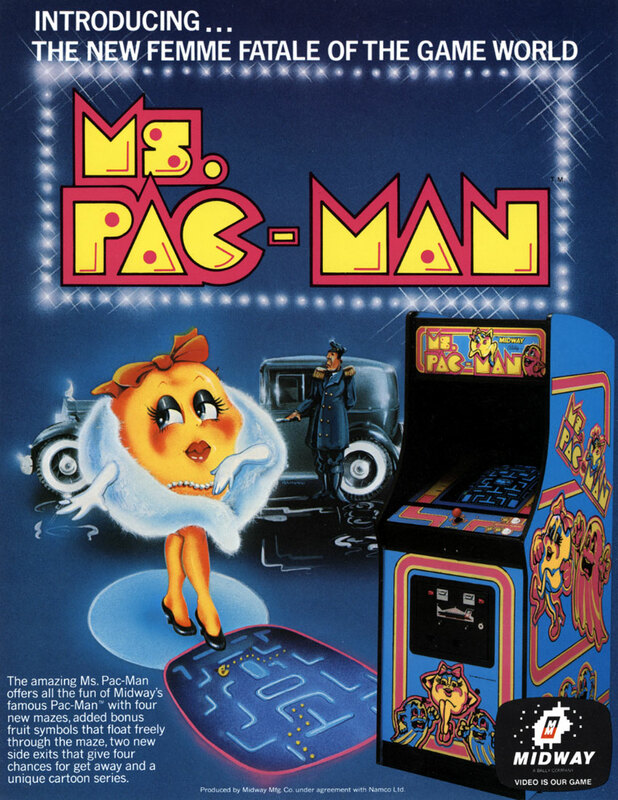 Midway felt that the sequel had to conform to the already established Pac-Man image, and demanded the legged character gone. So instead they dressed Pac-Man in drag. With a red bow and lipstick, the female version of Pac-Man was unleashed. 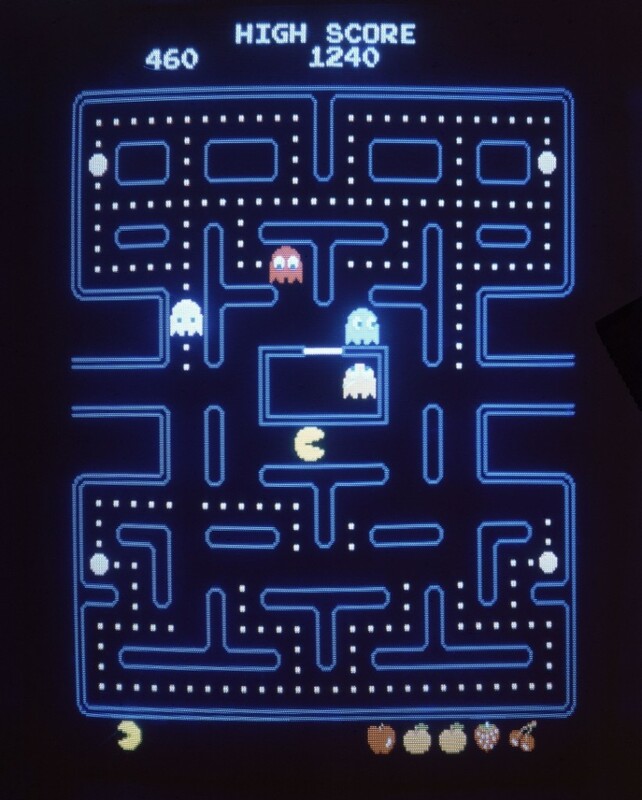 Ms. Pac-Man was released by Midway in 1981, without the consent of Namco. Despite its somewhat shady origins, in was in many ways a better game than the original. The public had figured out "patterns" for Pac-Man's one maze that made it possible to play the game near indefinitely. Ms. Pac-Man with its four mazes were much more difficult to find patterns for and added more variety to the game. As a result, Ms. Pac-Man was as great a hit as the original. Eventually, Namco released Super Pac-Man, the offical sequel. It was however nowhere near as popular as either of its predecessors. Much of the original's appeal was that the game was simple and intuitive. Super Pac-Man was not. It required the player to eat keys to open doors in order to get to the food, introduced tiers of power-pellets and just generally complexed it up. Have a look at the instructions to the left for the whole breakdown. Another reason for its wanting sales may have been that it came out in 1982, as the video-game industry started to see declining sales all around. Midway released several other semi-sequels to Pac-Man, most of them very close to the original in style. They were all produced without the permission of Namco, and thus eventually led to the termination of the licensing agreement between the two companies. PS: During a trip to the 2010 Festival of Games in The Netherlands, Tōru Iwatani brought along his original designs for Pac-Man. Control, a Dutch gaming magazine managed to get some pictures. PPS: According to The Ultimate History of Video Games, by Steven L. Kent, the settlement between The General Computer Corporation and Atari, was actually Atari's way of buying them out of the business. Atari fully expected the young upstarts to take the money and do nothing, and were actually quite surprised when they showed up three months later with their first game: Food Fight. They eventually became one of Atari's most productive third party developers, producing seventy-two games in the period between 1982-1984. Aah Pac-Man. I remember I used to bring a handheld version of the game to kindergarten. Those were the days! I think I remember the one you mean :) Those LCD black and white handhelds were the first games me and my cousins got before we could afford computers.